30.10.07 – By David Janke: In five short days, one man will stand atop the super middleweight division. For boxing fans around the world, those five days just can’t seem to go by fast enough. This is one of the most highly anticipated match-ups in recent memory – anytime two fighters of this caliber step into the ring together, it is sure to be an amazing fight. That much, everyone agrees on. What almost no one agrees on is, “who will win?” It seems that fans and boxing analysts alike are up in the air on trying to predict the winner in this fight. It is speed versus power; experience versus youth. 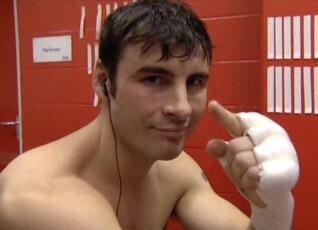 For every advantage Calzaghe has, it seems as though Kessler has a different one to even the score. For Calzaghe, this fight can put to rest all of his critics who claim he has not fought the best opposition. For Kessler, a win over Calzaghe will be his springboard to stardom. He will have beaten a top ten ranked pound for pound fighter in Calzaghe (who is ranked the eighth best pound for pound boxer in the world by The Ring as of October 22nd). Once and for all, all of the questions will be answered this Saturday. No more discussions, speculation, or guessing games. But isn’t that half of the fun for us boxing fans? Strategy to win: Calzaghe must utilize his superior hand speed to keep Kessler off balance. He must use continuous head movement to avoid Kessler’s devastating one-two combo he showed against Andrade. Although Calzaghe can stand in close and trade punches fairly well when he chooses to, he should avoid that tactic against this particular foe. If he trades punches with Kessler he will be knocked out. He must box the stronger puncher and use his jab to set up his power punches and to try to control the momentum of the fight. Notable fight: Against Jeff Lacy – March 2006. Jeff “Left Hook” Lacy came into the fight as the favorite in many people’s eyes. What ensued was nothing short of a brutal boxing clinic, as Calzaghe outclassed Lacy for 12 rounds. This loss changed the trajectory of Lacy’s career – at the time he was looking up in weight to take on the likes of Roy Jones Jr. and Antonio Tarver. It has taken Lacy a long time to recover from his brutal loss at the hands of Calzaghe followed by shoulder surgery after a subsequent fight. Lacy recently signed with Oscar De La Hoya’s Golden Boy Promotions to try to revive his career. Traveling to the UK to face Calzaghe, Lacy was 21-0 coming into the fight. The defeat by Calzaghe is still Lacy’s only loss, and he is currently ranked the #4 super middleweight challenger by The Ring magazine as of October 22nd. Notable Fight: Against Librado Andrade March 2007 – Andrade is currently ranked as the #5 super middleweight challenger by The Ring magazine as of October 22nd. His loss to Kessler is the only one of his career. Kessler actually won this fight 120 – 108 on all three of the judges’ scorecards. (And yes, the fight was actually as one sided as the cards indicate.) If Andrade showed anything, it’s that he has a granite chin. He took everything Kessler threw at him and then some. Both of these boxers need each other – each relies on the other as a stepping stone to propel their career ahead. Calzaghe wants to put an exclamation point on the closing year of his career, while Kessler could be considered one of the 10 best pound for pound fighters in the world with a victory over Calzaghe on his resume. If Calzaghe beats Kessler, certainly this win will silence the remaining post-Lacy critics who still question his opponents. (Many of his critics feel that Kessler is a better opponent than Lacy was – myself included.) It seems everyone disagrees over what the outcome of this fight will be. But one thing that no one disagrees about: Joe Calzaghe versus Mikkel Kessler is boxing at its finest.